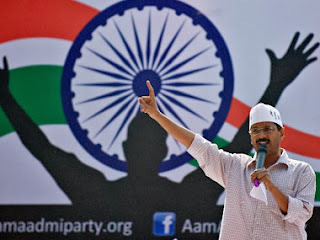 The Prabhakar Post: AAP Delhi Victory:Turning Point in Indian Politics ? AAP Delhi Victory:Turning Point in Indian Politics ? With all the predictive intelligence and software employed by news channels they still could not fathom the utter alienation of the 'aam admi',common man,hoi polloi - call what you may. From someone taken as some kind of a joke,a non celebrity - Arvind Kejriwal became an overnight gaint killer in Indian politics.People have gone into social service in trying to alleviate poverty or educate the rural masses but here was a man who looked at the urban 'poor'. Statistics measure poverty through the BPL(Below Poverty Line) parameters but surprisingly there would be more urban middleclass 'poor' people than though and these are the truly neglected.Some who have job losses or become handicapped due to accidents find themselves at the bottom of the ladder without a source of sustenance.where they differ from the rural poor is that people in villages have some parcel of land no matter how small or divided where they can raise at least a minimal amount of food. Cities overun with migrants who have sold their village land and moved with family and lost whatever they possessed before finding a source of income is common.Yet there isn't one single Government iniative to change the status quo. Secondly,all that politicians look for is a shortcut.Pay doles and get votes in return.Look at all the sundry 'Reservation' schemes running across India and across the various political parties! Is there any party that runs education or basic job skills programmes? That brings us to the AAP.Heartening that their candidates have experienced life - a journalist,an unemployed,a commando who fought terrorists.People who can understand the pathos of daily living.Who know what a struggle day to day life is for most of us. Understanding that most of India will be living in cities in the coming decades.Social issues,issues of communication.No more fiery oratory before elections.A proper report card on how the varios MPs,MLAs,councillors perform.Pipe dreams? At least this bunch of activists turned politicians who have made it their mission to bring some amount of accountability to mainstream issues is a breath of fresh air.Will it sustain?Will innate human greed for money and power destry the innocence of AAP?Will the leadership be able to hold onto their ethics? These are some fundamental questions that only Time can answer. Till then let us enthusiastically welcome this new found zeal to become a more responsible Nation that first improves its own conditions through its own people.That is true 'Swadeshi'. Arvind Kejriwal,Manish Sisodia,Kumar Vishwas&Team.Salute you Davids for taking on mighty Goliaths.May This Courage Never Wane...!!!! !